This is a simple scissors skills art project for little ones that are learning how to cut. Materials Needed: paper cups, scissors, variety of paint colors, markers, paint brush, Elmers glue, scraps of paper for stem and leaves, and a colorful piece of cardstock. 1. Have your toddler use scissors to cut small slits around the paper cup. You can draw lines onto the paper cup with a marker to show them where to cut if you want this to be a little less self-directed. 2. Fold the petals down. Encourage your child not to pull too hard though... or petals fall off :) Like in our case. 3. Use markers to decorate petals and center of the flower. Goofing around with a paper cup is always fun- he was pretending it was a microphone and was singing loudly. 4. Gather some paint and a paint brush and paint the petals of the flower. 5. While your child is painting, cut some leaves and a stem out of scrap paper. 6. Using glue, attach the stem and petals to the piece of colorful (or not colorful :)) cardstock. I drew a glue outline for my son and then he stuck everything on independently. 7. Put a big glue circle at the top of the stem and glue your paper cup flower into place. 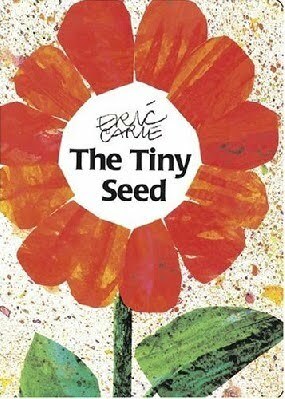 Read Eric Carle's book The Tiny Seed either before or after you finish this flower project and talk about how beautiful flowers come from little tiny seeds. and then go plant some seeds in your backyard or go on a nature walk to admire all the pretty flowers around where you live! This activity allows for acquisition of new vocabulary (petals, stem, etc... however in depth you want to get depending on your child's age) and lots of conversation. That is an awesome 3D project. I always have the hardest time coming up with 3D ideas! That looks almost like the book. Very cool project that we will have to try sometime. This is stunning....easy to follow.